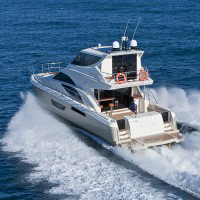 June Foreshore Marine Exhaust News: Experience is the key factor … every time! More Success!!! Experience is the key factor… every time! In last months newsletter, we were midway through a tricky exhaust job on the stunning Assegai 44 “Megumi”. Recent work by Foreshore Marine Exhaust: Increased exhaust on Maritimo. Read testimonial below.